2011 Volvo S60: How Do You Say Buick In Swedish? The Chinese have bought Volvo, but can the newly-redesigned 2011 Volvo S60, unveiled this morning ahead of next month's Geneva Motor Show, finally elevate the Swedish-founded and American-tainted brand from knock-off Canal St. faux-luxe to a true entry-level luxury contender? The all-new Volvo S60, first previewed as a concept at last year's Detroit Auto Show, makes its international debut at the 2010 Geneva Motor Show. After first teasing the new S60, then dropping a couple of photos, Volvo's let loose with the full monty. What we're seeing is a new sedan continuing the new hotness in design language of claiming a four-door has a coupé-like design. Luckily, the new S60 at least looks like it's trying. 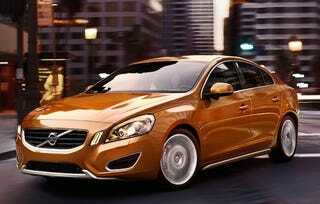 It certainly looks from the exterior to be sportier and more distinct than previous Volvo sedans. The C-pillar stretches all the way to the tail lamps — and the roof line is accompanied by a new contour on the shoulders on either side of the lower body. This creates a gentle double wave in the line from the headlamps at the front to the tail lamps at the rear. The S60's athletic stance is accentuated by a sculpted bonnet and short overhangs on both the front and rear, plus what Volvo's design team calls a "racetrack" design. We're not sure what that means but Volvo claims the car's lines "do not end abruptly but instead continue to flow organically, echoing the smooth shapes of the racetrack." Whatever that means. We just know is it's pleasing to look at. Although not what you'd call a sporty car, you can make the new S60 look sportier with an exterior styling kit that incorporates front and rear skid plates, two frames in the lower valence, side scuff plates, exhaust tailpipe finishers and 18-inch alloy wheels. We say stay away. In the engine compartment, the 2011 S60 range will, from launch, be available with a choice of two diesels and one gas engine, including an uprated high-performance 3.0-liter T6 gas engine (a Ford shortinline-six) rated at 304bhp, a 2.4-liter 205bhp D5 and a 2.0-liter 163bhp D3 powerplant. A DRIVe version powered by a 1.6-liter diesel engine with CO2 emissions of approximately 115g/km and fuel economy of up to 65.7mpg (combined cycle, preliminary figure) will join the range later in 2011. Sorry folks, no "R" version — at least not yet. The new S60 also has all the safety bits you're expecting out of a Volvo including a new Advanced Stability Control and corner traction control system. All well and good but it's the interior that kills the entry-level luxury experience for us. While we haven't seen it in person yet we're not thrilled with how it looks in press photos. They show what appears to be a plastic-filled interior that simply screams "Ford" or worse, "Chevy." All in all, the attractive exterior mated to a nothing-to-write-home-about engine lineup and a "meh" interior make the new S60 more a rival of Buick's vision of world class than a serious contender for the real world class — Mercedes, BMW and Audi.